To the 922,530 brave souls who paid their way into the Polo Grounds in 1962. Never has so much misery loved so much company. 6. Wait Till Next Year? We're Fine Now! At long last the flood of excellence is dammed. The trend reversed. The losers have their day. 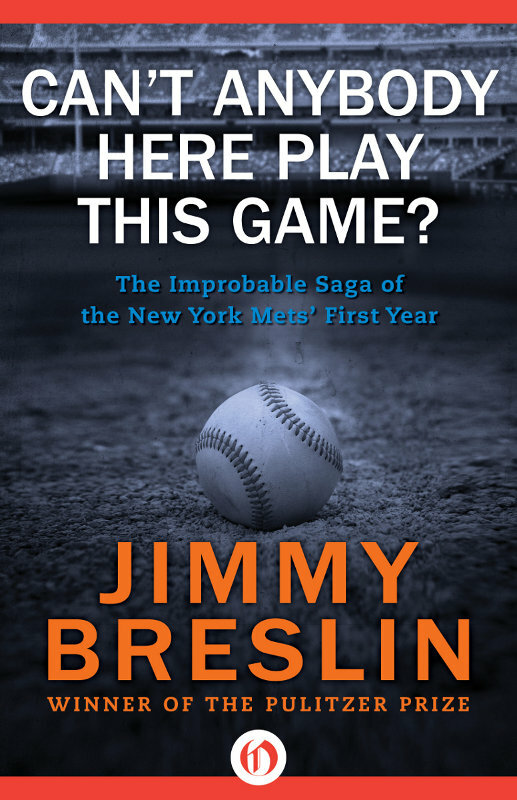 Jimmy Breslin has written a history of the Mets, preserving for all time a remarkable tale of ineptitude, mediocrity, and abject failure. It's stories like his that are important. They spur the losers of the world to take heartâto rise and lose again. Without losers, where would the winners be? So who, in the final analysis, is most entitled to historic memory? I feel eminently qualified to write the introduction to a history of the Mets. I operated the St. Louis Browns. It was our image that was toppled from its niche in the darkest recess of Cooperstown. It was from us that the Mets, with pitiful ease, wrested the title of The Worst Club in Baseball History.” It was, in truth, the Brownies who made possible the Mets' only victory. I must admit, in fairness, that the Mets deserve the title. They won it fair and square. They achieved total incompetence in a single year, while the Browns worked industriously for almost a decade to gain equal proficiency. We employed Patkin and Price, both professional clowns. They beat us again; they had Marv Throneberry. We had the help of the American League, they the wholehearted cooperation of the National, plus the assistance of the league's expansion committee, of inestimable advantage in any drive for the bottom. Here, in clear focus, is the rock being thrown to the sinking swimmer. Here's Mrs. Payson, who justifiably emerges as a lady of courage and class, if not acumen; Casey Stengel, whose reputation needs no burnishing from this writer; and New York baseball fans, who unquestionably deserved a far better shake. But the philosophy of baseball, like that of the late Texas Guinan, precludes fair shakes. In this game when they're down you tromp 'emâgoodâlest they someday get up to annoy the winners. Competition is for professional football and amateurs. Furthermore, according to Walter O'Malley, it's socialistic. So the Mets started with the worst pitching, backed by the most deplorable infield and outfield, ever assembled on a single diamond. While “selecting” their players they didn't (as the expansion committee professed so loudly to fear) dilute the talent pool of the major leagues, but dealt almost a death blow to the Sally. The caliber of the Mets' play could easily have earned for them other honors. That of “Games Played Most Often in Secret,” for instance. In this, as in almost all else, they failed dismally, ending the season with well over 900,000 paying customersâa tribute to Casey Stengel's sure knowledge of public relations and the enduring fanaticism of Giant and Dodger fans. It is unrecorded how many paid more than once to see baseballâMet style. It is, however, quite possible that more different individuals saw the National League teams than wandered from Coogan's Bluff to watch the more skillful exhibitions in Yankee Stadium. It is my understanding that Mrs. Payson, the club's principal angel, has both money and real staying power. I hope so. I hope too that both of these equal Mr. Weiss's prospective tenure in office. Now, lest the reader feel I am picking unfairly on the Met general manager, let me explain. I am. Intentionally. Mr. Weiss took the bows during a long and successful career with the Yankees. I would be the last to deprive him of equal rights with the Mets. He helped to conceive them. Why shouldn't he nurse them along? Boy! What a picture that makes. The Mets is a very good thing. They give everybody a job. Just like the WPA. in the office says the weather is clear, with a high for the day of 54 and a low of 40, which is fine to keep work moving along on this $19,100,000 stadium New York City is having built alongside its World's Fair grounds. Outside, a pale sun washes what is now a latticework of steel, but which will be, hopefully by summer, a horseshoe-shaped ballpark seating 55,000 people. And crawling over the steel beams on this day is the flower of New York's construction trades, a group of 483 tin-hatted workers. As you watch, you are struck with the immenseness of a construction job such as this one. Take that guy way up on the top, the one moving along a solitary white-painted beam that seems to be held up by nothing. His name is Tommy McLaughlin, and he has a wife and six kids at home. He is over five hundred feet in the air, without even a rope to hold onto. One strong gust of wind or one slippery spot on the beam, and that will do it. You'd be surprised how many times this happens on a construction job. But here he is, walking like a guy going over to play the jukebox in the neighborhood saloon. And all around the place there are workers just as high up and taking just as many chances. It makes you nervous to look at them. It also would frighten hell out of you to pay them. McLaughlin is on the clock as an iron worker. At $5.25 an hour. There are steamfitters up there, too, and they come in at $5.37 an hour. Then there are electricians ($7.63), laborers ($4.94), wire lathers ($5.72), and operating engineers ($5.43). The payroll for this one day is going to run $15,585.72 by quitting time. This is only part of the story. The planning and political wrangling that went on earlier were incredible. Why, once they argued for two days about how many toilets the new stadium should have. Plans called for 329, but somebody insisted that he would not be associated with a stadium that did not have at least 600 johns. Finally a Parks Commissioner named Newbold Morris put his foot down when he found an architect busily penciling in a spot to hook up Unit No. 526 of American Sanitary's best. “What are we building, a ballpark or a place to go to the toilet?” Morris said. You think of all these things as you stand and watch this big job. And then, just for a minute, everything changes. The ground, piled with dirt and covered with empty beer cans and crushed coffee containers, turns into cropped Merion blue. The turf surrounds an infield that doesn't have a pebble on it. The bare steel beams turn into gleaming stands, and they are filled. You can hear the crowd making noise. They are building a brand-new stadium for Marvin Throneberry. The New York Mets are a team that was formed at the start of last season. They lost 120 games, which made them, on paper, the poorest team in modern baseball history. On the field they were even worse. The Mets did not lose games merely because they played badly. Never. The Mets lost because they played a brand of baseball which has not been seen in the Big Leagues in over twenty-five years. And in doing this they warmed the hearts of baseball fans everywhere. They became, in their first year of existence, almost a national symbol. Name one loyal American who can say that he does not love a team which loses 120 games in one season. REPORTER: Did you know it was going to be a home run? REPORTER: How could you tell? PLAYER: Because I seen it go into the stands. will go so far as to tell you that Herman was a good fielder. He had good hands and could move, Tommy insists. Once in a while he would misjudge a fly badly. But only once in a while. Day in and day out, he was as good as they ever came, Tommy says. “Gimme one of them heavens to Betsy drinks you always make for me,” the Babe said in his gravelly voice.